Good health of a person can achieve wealth, happiness, fame and in fact, anything in this world. Physical education ensures good health of a student. Our body helps us to attain all our dreams and goals. Hence, Physical Education is of utmost importance. Physical Education forms a part of the curriculum and it includes skills development and physical fitness. The athletics and various other physical activities improve the overall psycho-motor skills and agility of the students. The playground in a vast area of 10acres is equipped with all facilities to play and conduct Indoor and Outdoor games including track and field events. The students are commuted to the Sports Complex as per the time-table for their regular sports classes and for special coaching. The students of middle school constitute the Juniors Team. Tournaments will be conducted and prizes will be awarded. 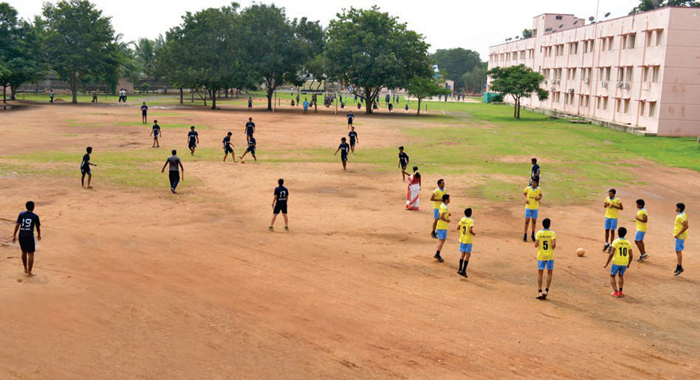 The students of Secondary and Senior Secondary Division constitute the Seniors Team. They are divided into four different houses. In each house there will be two divisions – one for boys and the other for girls. Tournaments will be conducted House-wise separately for Boys and Girls and prizes awarded during the Annual Sports Day Celebration. For the following items of Athletics and Games, special teams will be formed from Junior Level to Super Senior Level and they will be given special training under Professionals. This will enable them to participate in the Zonal and the National Tournaments. Time: 4.00 p.m. – 5.30 p.m. on specified days as notified in the calendar. For the selected students, attendance is compulsory and Dropout in the middle is not permitted . If a student withdraws from this coaching, then he/she has to pay the fixed withdrawal fee and the same will be collected along with the next term fees.